OutCide's specially developed gutter vacuuming system and hot pure water cleaning system is suitable for cleaning all types of plastic, metal and seamless gutters, including uPVC and painted wooden fascias, soffits and barge boards. We clean your gutters by initially clearing any blockages or build ups of biological growth such as; leaves, branches, moss or dirt sediment using our wet and dry vacuum pole system. Rainwater gutters and valleys should be kept clear to prevent overflowing and potential damage to your property. The exterior of the gutter, fascia boards and soffits are cleaned using heated pure water applied with a soft monofilament brush on a telescopic pole. The heated water dislodges and absorbs large amounts of dirt and green algae from the uPVC or painted wooden surface which is then rinsed away. The water used in the cleaning process is specially softened, filtered and polished to remove any chemicals and dissolved solids, and then heated using our state of the art vehicle mounted equipment. The water is then fed through our long reach carbon fibre pole system, which allows us to clean high eaves, gable barge boards and hard to reach areas safely from the ground. 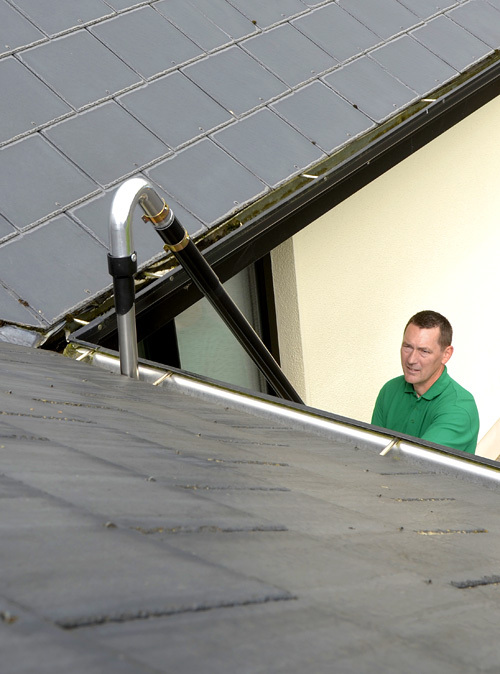 For more information or a free survey of gutter and fascia cleaning for your house in Galway or Mayo, please contact Seamus Staunton on 086 820 4711 or email info@OutCide.ie. We will be happy to provide a competitive, no obligation quote.